Scattered thunderstorms in the morning becoming more widespread in the afternoon. High 68F. Winds SSW at 10 to 20 mph. Chance of rain 90%..
Showers in the evening, then cloudy overnight. Thunder possible. Low 41F. Winds NNW at 15 to 25 mph. Chance of rain 40%. Above: Sixth-grade winners of the Blizzard Challenge were Isaac Becker, Joey Frenna, Isaiah Franzen, Oliver Ackerson, Matthew Roth, Tai Cummer and Meredith Ellingworth. 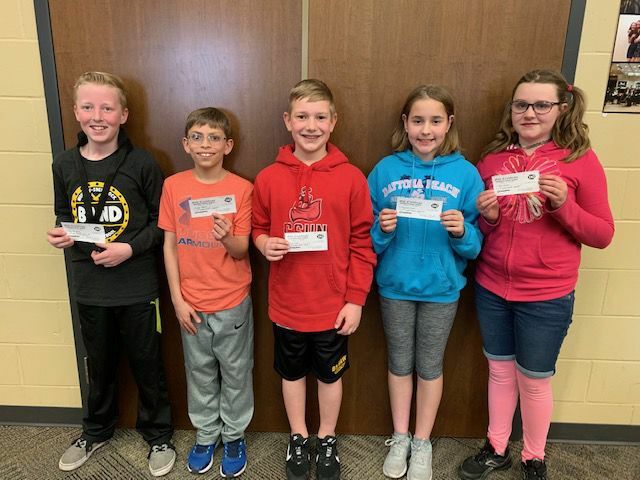 Right: Fifth-grade students Ian ten Hoeve, Lucas Geerts, Nile Epley, Savannah Fisher and Alex Johnson earned Dairy Queen Blizzards. Not pictured were Avery Corcoran and Eva Bruns. 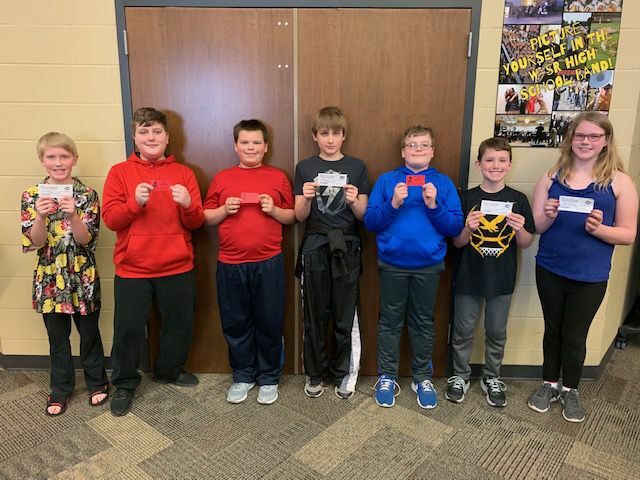 Sixth-grade winners of the Blizzard Challenge were Isaac Becker, Joey Frenna, Isaiah Franzen, Oliver Ackerson, Matthew Roth, Tai Cummer and Meredith Ellingworth. Winter months can be a drag with frigid temps below zero and endless amounts of snow to shovel. We often experience a “lull” with students being motivated to practice their band instruments during these winter months. So, to ramp the excitement back up, the Waverly-Shell Rock fifth- and sixth-grade bands had a competition during February and March with the winners receiving a free Dairy Queen Blizzard. First place received a medium Blizzard, second place received a small Blizzard, third place received a mini Blizzard, and honorable mention received a free DQ treat of their choice. Students kept track of the days they practiced at home with a parent’s signature for each day of practice. They also had opportunities to play a fun pop tune and record themselves playing it. Days of practice and video submissions resulted in collecting a certain amount of points. After tallying up the points, we had some outstanding results. A special thanks to our sponsors for helping cover the costs of these treats: Craig Hancock, The Greater Waverly Municipal Band, and the Eckerman family. In our fifth-grade band, we had some ties for first and second place. First place winners were Ian ten Hoeve and Avery Corcoran, second place winners were Alex Johnson, Eva Bruns, Savannah Fisher and Nile Epley, and our third place winner was Lucas Geerts. Congrats to these fifth-graders for their hard work. Our sixth-grade band, we also had some ties. First place winners were Daniel Becker and Meredith Ellingworth, second place winner was Tai Cummer, third place winner was Oliver Ackerson, and honorable mention winners were Matthew Roth, Isaiah Franzen, and Joey Frenna. Congrats to these sixth-graders for their hard work. Scattered thunderstorms in the morning becoming more widespread in the afternoon. High 68F. Winds SSW at 10 to 20 mph. Chance of rain 90%.